Your decision to purchase a fire resistant cabinet from Multifile is not just about protecting your important documents. The cabinets and safes we deliver could weigh as little as 50kg or as much as 750kg and more. 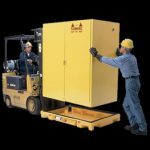 Delivering the cabinet to your location safely is just as important as helping you choose the right safe for your needs. Multifile uses companies who are skilled in handling these cabinets. They are used to handling and delivering ‘sensitive freight’. We have been doing this for over 15 years and we know what we are doing. Not just locally but AUSTRALIA WIDE. Yes and of course, we will place it into the position and remove the packaging from the site. No more for you to do except open it up and start to store your important documents. *Freight Additional. Shipping and installation costs provided at time of enquiry or purchase.